A quick, protein-packed way to start your day! I’ve been a fan of oatmeal or porridge since I was a little kid and only learned recently that my mother – who kindly made it for me whenever I requested it – can’t stand the stuff. 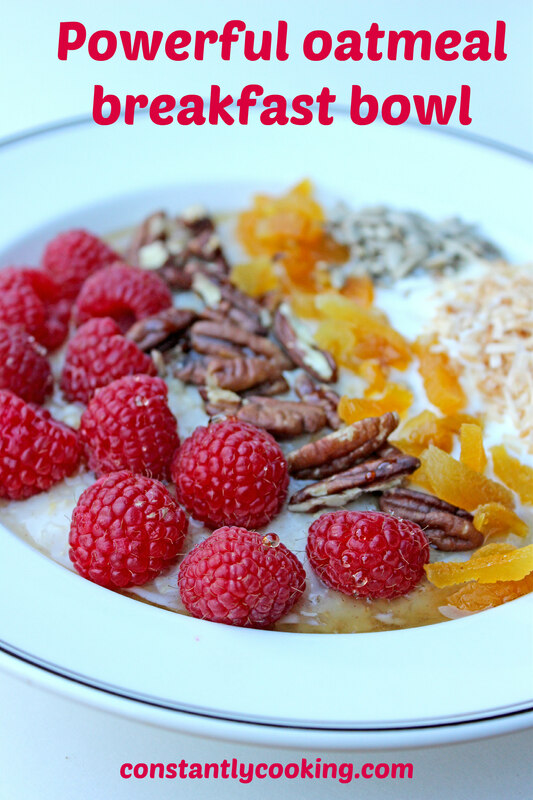 To me, a piping hot bowl of oatmeal is as comforting as it is satisfying – no need for a midmorning snack on oatmeal days! This recipe includes quinoa flakes which add both protein and flavour to the bowl. (If you’re a fan of quinoa flakes, check out this great cookie recipe and this tasty applesauce loaf.) Cooking the oats in milk and adding nuts, seeds and yogurt on top also increases the protein. You can easily make this bowl dairy-free (it’s super yummy made with almond milk and coconut milk yogurt is also fabulous) and you can vary the toppings to suit your tastes – you can even use trail mix to make it super simple! I usually prep enough toppings for several days and then it’s really quick and easy to whip up this hearty, delicious breakfast to start the day off right. Place a medium pan over medium high heat and add oats, quinoa flakes, milk, grated apple and cinnamon. Bring to a boil. Reduce heat and simmer, stirring often, until oats are cooked (about 3 minutes). Alternatively, cook the oats, quinoa flakes, milk, apple and cinnamon mixture in the microwave in a medium-sized bowl medium-high power for about 2 minutes, pausing cooking once or twice to stir. Spoon the cooked oat mixture into a broad bowl. Arrange toppings over the oats in an attractive pattern, then drizzle with maple syrup, honey or agave syrup. 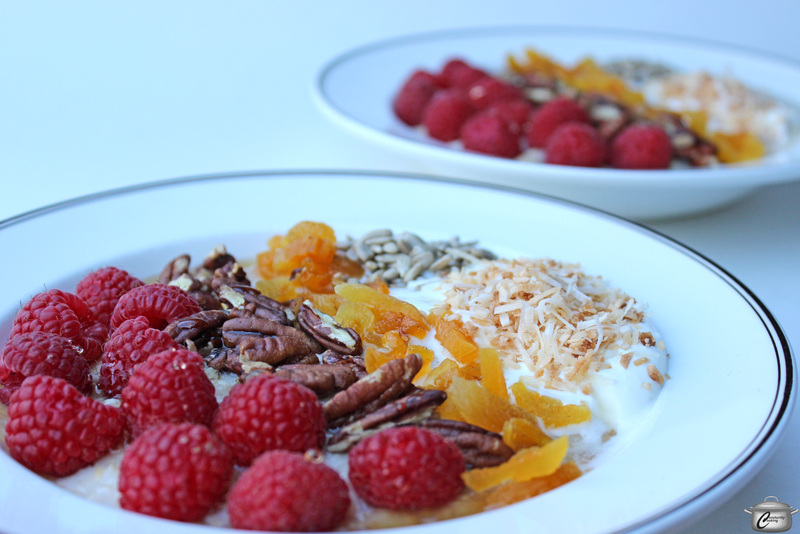 This entry was posted in bowl, Breakfast and tagged bowl, breakfast, coconut, dairy-free, fruit, hearty breakfast, nuts, oatmeal, oatmeal porridge, oats, Paula Roy, porridge, seeds, vegan, vegetarian, yogurt. Bookmark the permalink. Thanks – it sure is a delicious dish. I don’t think I could have made it through this long and busy day without that as my first meal!